Some Lincolnshire industrial photography for The Sunday Times here from the British Steel works at Scunthorpe. One of the pleasures of working for newspapers is the sheer diversity of places and people I encounter. 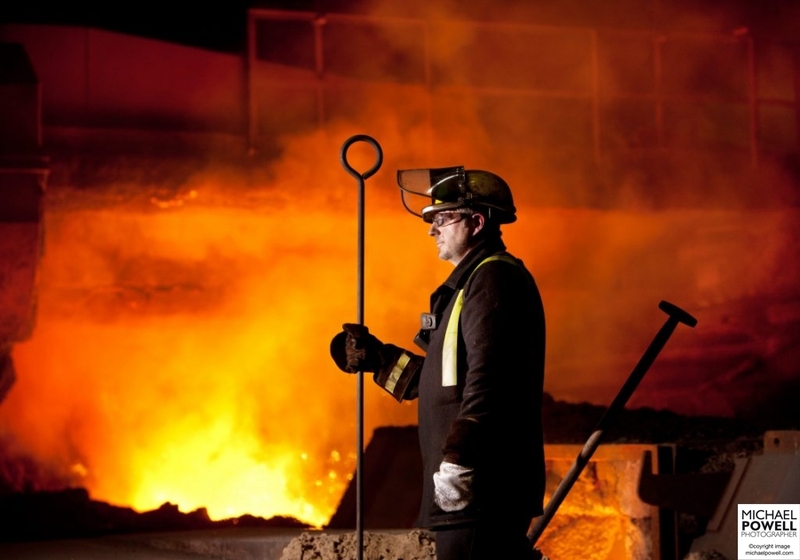 A steelworks is of course a potentially very dangerous place to work so it’s not often that non-employees are allowed in. This was the third time I have taken pictures in a steelworks so knew some of the difficulties I’d encounter. Following a health and safety induction one has to change into protective clothing that includes a wool high-vis non-flammable overall, thick socks, protective boots, ear defenders, hard hat, gloves and glasses. Not the easiest of gear to wear when carrying camera equipment never mind actually take photographs. 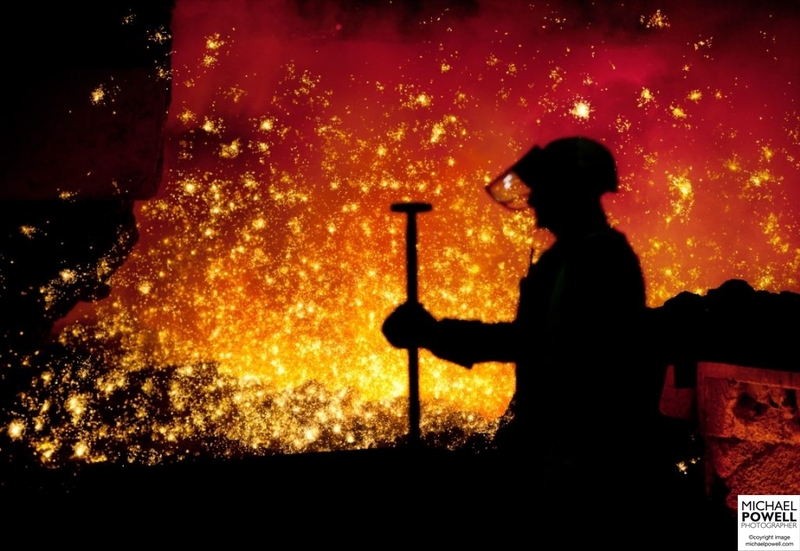 Sunday Times writer, John Collingridge and I were given a guided tour through the steel making process from the ore blending beds to the rod mill via the blast furnaces, basic oxygen steelmaking plant (BOS) and concast plant where ‘blooms’ or slabs are created by a casting machine. Steel from Scunthorpe is used for railway tracks around the world (including its own internal railway which is the longest in Britain), major construction projects such as the Petronas Towers in Kuala Lumpur, The Shard, Olympic Stadium and Crossrail in London right down to the smallest of safety pins. 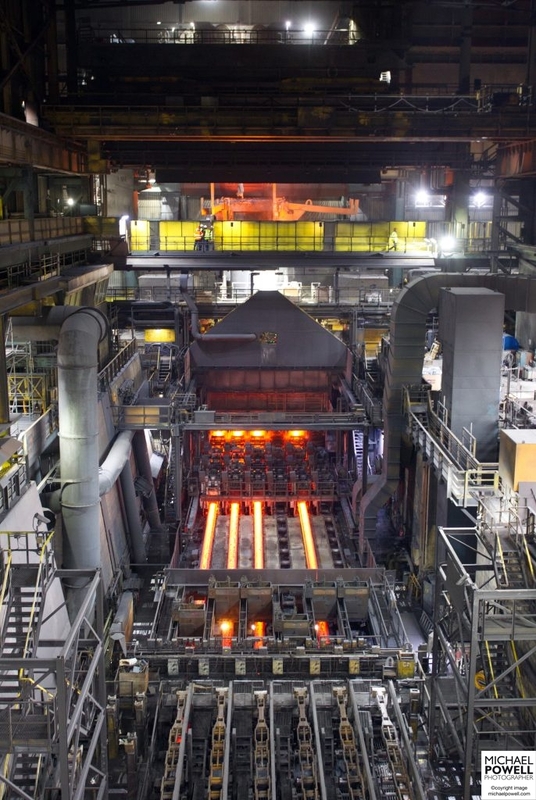 It was fascinating and the blast furnaces where iron ore is produced by blasting oxygen-enriched air can, for once, accurately be described as awesome (no pun intended). The noise, heat, sparks and river of ore gushing past was staggering and the whole process was of particular interest to me as my grandfather was himself a Scunthorpe steelworker many decades ago on a site demolished during the 1980s recession. Following Greybull’s acquisition from Tata for just £1 last year, the renamed British Steel plant at Scunthorpe has turned a profit, vital to the steel town’s employment and local economy, though I would have liked to see more Hondas and Suzukis in the staff car park given my family are the marques’ dealer and have traded in Scunthorpe since 1933. British Steel, Scunthorpe. Robert Fox waiting to ‘dip’ in the Annie blast furnace. British Steel, Scunthorpe. Robert Fox about to ‘dip’ in the Annie blast furnace. British Steel, Scunthorpe. Blooms emerge in Caster 4. British Steel, Scunthorpe. The blast furnaces are named after British queens, Vickie (Victoria), Annie (Anne), Bess (Elizabeth) and Mary. British Steel, Scunthorpe. Inside the rod mill. British Steel, Scunthorpe. The ore blending beds. Behind are the blast furnaces named after British queens, Vickie (Victoria), Annie (Anne), Bess (Elizabeth) and Mary. British Steel, Scunthorpe. ‘Dipping’ taking place in the Victoria blast furnace. British Steel, Scunthorpe. The control room that overooks the Rod Mill The whole procedure is also monitored by cameras including within the blast furnace itself. A panoramic view of the British Steel site at Scunthorpe.